NASA’s website credits Wallace Broecker of Columbia University’s Lamont-Doherty Geological Observatory with coining the term “Global Warming,” in a paper he wrote in 1975. His prescient study didn’t catch on outside the scientific community, and later attempts by others to morph the moniker into “Climate Change” didn’t help. The apocalyptic issue he described warranted attention, but it was dismissed by many as a nebulous, “someday/maybe” kind of problem left for science to solve. However, as its component effects begin to manifest in plain sight, public awareness has turned to apprehension. Perhaps the issue’s most easily visible component in the Lowcountry is the rise of sea level. The Lowcountry has witnessed three consecutive years of flooding previously thought to be 1/1,000 year events. Projections from respected organizations like NOAA, NASA, and the Union of Concerned Scientists (UCS) suggest such events will get worse in years, not the lifetimes as originally thought. 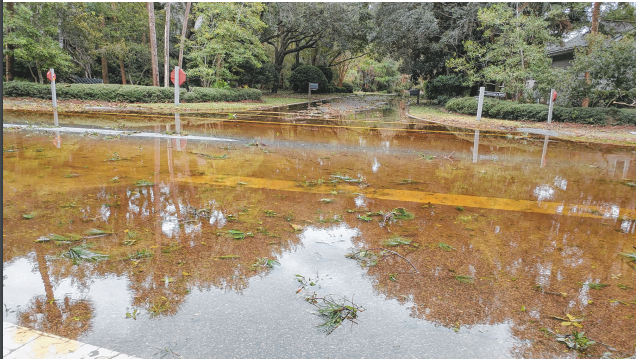 Responding to the threat, residents of Kiawah set about establishing the Sea Level Rise Sub-Committee (SLRsc) with the help of Kiawah Town Councilmember Diane Mezzanotte. SLRsc’s membership speaks to the depth of Kiawah’s talent pool. John Leffler – Ph.D. in Zoology/Ecology agreed to chair the SLR, and he is joined by Robert Cheney – MS in Physical Oceanography, Jim Chitwood – Ph.D. in Chemistry, Jane Ellis – Ph.D. in Plant Physiology, Jack Kotz – Ph.D. in chemistry, David Pumphrey – B.A. and M.A. in Economics, Lynette Schroeder – MBA, and James V. Sullivan – B.S. in Chemical Engineering, just to name a few. The group has spent the last year scrutinizing and responding to reports by the organizations mentioned above. “The results were sobering,” says an excerpt from SLR’s response. “Coastal areas with known flooding problems fared the worst, such as Louisiana, Florida Keys, Maryland Eastern Shore, and New Jersey. Kiawah-Seabrook may have 277 homes valued at $277 million suffering from chronic inundation by 2030. [However], their ranking of Kiawah-Seabrook as the most vulnerable of all South Carolina communities is misleading because they used US Census Bureau tracts to define communities… This means that their percent inundation calculations are higher since there is no inland, higher land to offset the low coastal terrain. SLRsc made the information more personal to Lowcountry residents by using “Mean Higher High Water (MHHW) datum based on the Charleston tide gauge station. MHHW is the average of… two daily high tides over a period of 19 years. It is essentially the boundary of salt marsh where it meets dry land. This is the average range of our current high tides every day. Flooding occurs when… sea water rises above this boundary and spills out across the landscape,” the report explains. The SLRsc account warns that the four feet of additional water brought in during Hurricane Irma would cover 73% of Kiawah, for example. The committee’s report pitches an interactive, web-based tool developed by the city of Charleston. It is available by visiting gis.charleston-sc. gov/interactive/slr/. “The baseline map shows the water line at MHHW. Sea level can then be added in 0.5-foot increments. To simulate the predicted extent of chronic flooding by 2060, add 3 feet to the MHHW level, 1.25 feet for the minor flood level plus 1.75 feet for sea level rise under the intermediate projection. The inundation maps found [there were] produced by Dr. Norman Levine and Lucas Hernandez of the College of Charleston and are the highest resolution, i.e. most detailed, maps available,” says the report. What to expect and how to handle it (e.g. likely things to plug into the tool) occupy the bulk of the report. The Sea Level Rise report is the marvel of technical writing you would expect, but somehow it remains equally “readable.” The observation/opinion is particularly noteworthy, given the topics’ complexity and the fact that dozens of separate assignments were stitched into a single, 123-page document. Managing the task required a standard format be applied to each topic/category including; Significance, Current Status on Kiawah, Concerns, Recommendations, Responsibilities and Partners, and Recommended Reading/Additional Information. The template was applied to at least a dozen issues. The section on the Salt Marsh Environment was particularly interesting. Marshes migrate, and competition between salt and fresh water inundation would halt that process and reduce the marsh and its grasses. Less marsh would exacerbate the effects of high water events, and one possibility SLRsc promotes is to re-nourish the marshes in a fashion similar to what has previously been done to the beach. The committee’s overview continued; “… [marshes] provide important protection for shorelines from erosion by buffering wave action and trapping sediments. Salt marshes reduce flooding by slowing and absorbing rainwater and protect water quality by filtering runoff and metabolizing excess nutrients… Marsh vegetation can raise land elevation by trapping sediment and adding organic matter. Kiawah has about 50 miles of marsh front compared to 10 miles of beach,” said the document. The SLRsc has done all the heavy lifting and research. The full document is available by visiting KiawahIsland.org/ wp-content/uploads/2018/08/FINALFlood-Sea-Level-Rise-Report-clickablelinks-1-1.pdf. As of this writing, SLRsc members are holding their breath in anticipation of a warm reception at a “stakeholders” meeting scheduled for Sept. 26.